For a recent project I needed to calculate the pairwise distances of a set of observations to a set of cluster centers. In MATLAB you can use the pdist function for this. As far as I know, there is no equivalent in the R standard packages. So I looked into writing a fast implementation for R. Turns out that vectorizing makes it about 40x faster. Using Rcpp is another 5-6x faster, ending up with a 225x speed-up over the naive implementation. aka Cygwin or Windows ports of zsh, bash, etc. ConEmu is definitely a must have. Adding clink to your system does not hurt and makes cmd.exe somewhat usable. If you want to try another shell I would give NYAOS a try. Unfortunately the documentation is thin and the community is mostly Japanese. 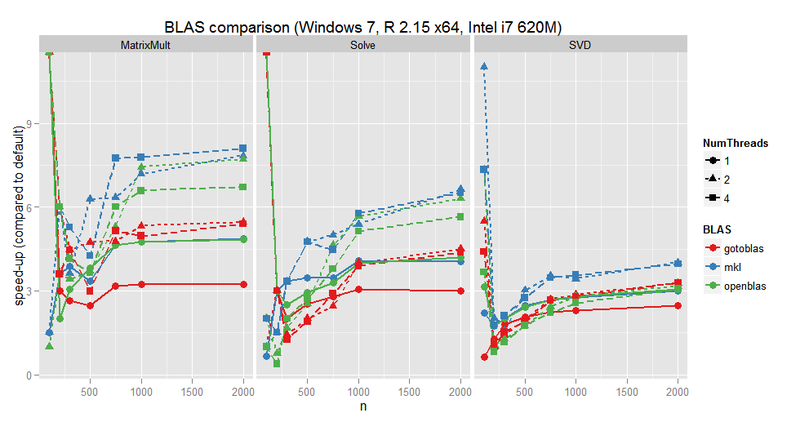 It is no news that R’s default BLAS is much slower that other available BLAS implementations. In A trick to speed up R matrix calculation/ Yu-Sung Su recommends using the ATLAS BLAS which is available on CRAN. 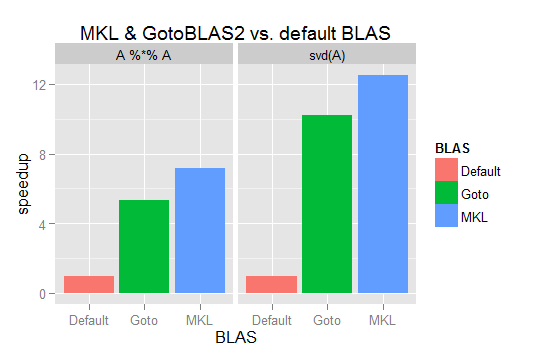 When I learned about the possible speed-up a while ago I tried several BLAS libraries and I found that GotoBLAS2 was giving me the best performance among the open-source BLAS implementations. Today I decided to check once again how much it makes sense to replace R’s default BLAS library. I recently looked at the Sublime Text and saw a feature that I liked but have not seen yet in my favorite editor vim: editing multiple selections at once. Vim is very powerful and has great multi-line editing features, but as far as I know there is nothing that allows users to edit multiple selections with instant feedback. I sometimes run into the problem that I work on a computer (via ssh) which does not have all the tools and libraries installed that I want to use. In the past I went on and compiled all I needed manually and installed them into ~/opt. Problem: you don’t have any kind of package management for the stuff you installed into ~/opt. With stow you install each piece of software into a different directory and you use stow to create symlinks.